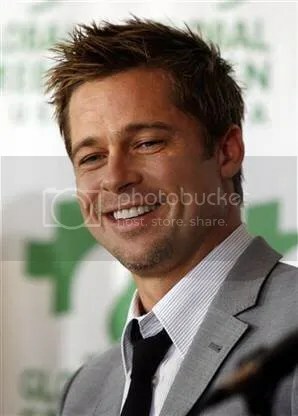 Brad Pitt, who in my opinion over the past couple of years has gone from OH SO HOT to OH SO NOT, showed up yesterday for the premier of his new Quentin Tarantino movie, Inglourious Basterds in Germany. The event was said to have included a red carpet gala and a few media hounds just to see if it was buzz-worthy. Bard was said to look smashing in Tom Ford, while sitting next to Tarantino with beer in hand. No reports if Brad unbuckled his belt and stuck his hand down the front of his pants during the movie, but the atmosphere seemed very relaxed. He was also reported to have spent a lot of time singing autographs after the premier. This was probably precipitated by the fact that the most revent scoop on the actor was when his motorcycle broke down recently and he had to catch a ride with the paparazzi. Pitt’s next appearance should be at the film’s Hollywood premiere on Aug. 10. Unless he breaks down again on the side of the road.. Here are some Pic’s from Brad OH SO HOT days!